Before, straightening the teeth could be burdensome. The hassle that someone will go through by wearing loads of metal wires and brackets are very common during those days. In fact, wearing traditional braces had become a social stigma. However, modern dentistry introduced a more convenient way of improving the people's smiles, and that is, through Invisalign. We at Avalon Dental Group understand the needs of every patient to enhance their smile without sacrificing comfort and esteem. With this, we provide Orthodontics procedure that is suitable for patients who want to have a discreet treatment. With our Invisalign alignment treatment, the patient can be assured an excellent result in a shorter period than of traditional braces. Invisalign is an advanced orthodontic braces option that is made up of clear, plastic aligners and is removable for easy cleaning. Many adults and even teens opted for this option because of its so many advantages. Yes, Invisalign might be pricey; however, there are available payment plans for an Invisalign treatment. Some dental clinics offer monthly payment options for all braces. 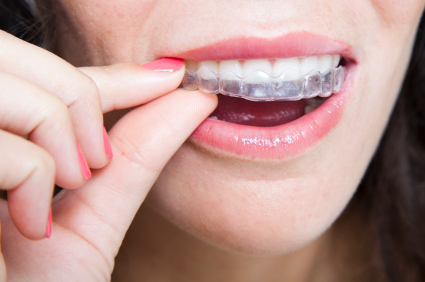 Though Invisalign creates a beautiful look, it is not for everyone. Invisalign can correct teeth alignment and teeth crowding, but someone with extreme bite issues should prefer traditional braces instead as it is the most reliable when it comes to fixing bad bites. People will not notice that someone is actually wearing an Invisalign. Invisalign is not noticeable at all which is best for someone who wants to remain low key while beautifying their teeth and smiles. All orthodontic braces treatment requires a retainer. No matter how Invisalign had perfected someone’s smile and teeth if the person will not wear retainers after the treatment, a tendency to repeat the whole procedure is possible. The risk of the teeth coming back to its original form is high without retainers. Since Invisalign is removable, someone who opted for it can remove the dental appliance from the mouth while eating. Let us help you improve the appearance and form of your teeth! Book your appointment with us at Avalon Dental Group for your Orthodontics needs in Sugar Land, TX. We are located at 2205 Williams Trace Blvd, Suite 108 Sugar Land, TX 77478. The field of dentistry has benefitted greatly from the advancements in materials and technologies to help promote good oral health. Yet as a dentist myself, I've seen that my profession has embraced these new technologies at the risk of spending less time promoting "prevention through education." The truth is the healthiest mouths are not the mouths of the wealthiest people, but rather the mouths of educated people. This blog is my effort to educate the public and promote good oral health.